It's time to leave these shores for various but mostly spam-related reasons. Flibbertygibbet has a new home, at http://flibtowers.wordpress.com. Please do come and visit over there instead! I'm a freak, I know. I love January. Time to start over, it's even better for new pencil cases than September. A friend once told me that it's a lousy time to start those physical processes of transformation, like detoxes, if you live in the northern hemisphere. All we want to do is hibernate. I'll try to take the blog out of hibernation a bit more (woohoo says the world. Oh, no it doesn't) but as it turns out I'm writing loads elsewhere which is why this has been so sadly neglected. I left an unfilling job and now I'm freelancing - all over the place. And I've had s-u-c-h-f-u-n for the past three months! Some interesting work has already coming my way and there will be more. I've been cooking a lot, and watching a lot of movies. Jen, I have some new partners in crime for cinema outings. I miss the edginess of watching a film with you though, as I could never tell if you were going to walk out on me, heh. However the boy has a new Magic Cinema Card and he's just dying to use it. On Friday, The Road. The world has ended, the survivors have descended into cannibalism. Viggo's wife has walked off into the night and he's following her last words, to 'go south'. So many questions about this movie. Like, why did they replace the normal kid-sized kid from the movie with his much smaller doppelganger for the poster. It's not a barrel of laughs this one but the landscape is stunning. The ending irritated me. The kid really irritated me. Also Viggo looks a bit like my dad. Freaky. On Sunday, with a remit to choose something less mournful, we saw Up in The Air. Clooney being Clooney. Interesting tableau of modern relationships and how to be alone - and lonely - in a crowd of people. Best title sequence I think I've ever seen. It's from the director of Juno (also - good soundtrack) and while there are laughs in it, given that it deals with two very fundamental issues - relationships and redundancies, it's not ostensibly one to have you falling about. It's also that much more real than the former. And for various reasons, we went to see The Book Of Eli on Monday. I'm a big fan of From Hell, also directed by the Hughes Brothers. This movie is going straight there. I thought the Guardian review wasn't keen and then read the Observer one. Note: next time will read before going to the cinema. It's like a remake of the Road after the directors found God. I so nearly walked out, but wrongly thought the boy was immersed. Are you excited about Tristmas (as we used to call it) this year? I am. I really am. At the moment I am trying to strike the balance between making Flib Towers look like it's been covered in glue and then shat on by the glitter pigeons; and leaving it so late that I'll be waddling from all the mince pies and too lethargic to string a single streamer. Firstly, if you are going to be in London for Christmas and you're at a loose end, then check out what the lovely Simon from the Making Space is up to. He's running a Christmas Day craft workshop. 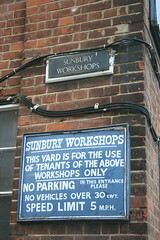 It's at Sunbury Workshops which are near Columbia Road. You can donate to charity if you like, but the tickets are free. 'Cos, you know, it's Christmas. There's soooo much baking going on around here at the moment. Despite my reservations about the amount of butter involvoed in most of recipes and the thoughts of handing loved ones a slice of heart disease on a plate, I have been cracking on with quite a few of the recipes from the Hummingbird bakery book. I heart it, I think. Because of that I am quite tempted to try the Primrose Bakery cupcakes although when I've tried them, I haven't been so impressed - perhaps because you've no way of knowing how long they've been around? Put the flour in a shallow dish and add the shortening and butter, chopped. Spoon the flour over to coat the fats, then put into the freezer for 20 minutes. While you're waiting for it, add the salt to the orange juice and zest, and place in the fridge. Blitz the fat and flour into crumbs in the food processor, then slowly add the orange juice til it gets to that stage just before it whirls into a huge ball of dough. Remove and combine it by hand, and divide into 2-3 discs to chill in the fridge (so you're always working with cold dough later). Wrap the discs in clingfilm and put in the fridge for 20 minutes, and preheat the oven to 220c/gas mark 7. Roll out the dough very thinly and cut out 24 circles. Place in the tin and fill each with less than a teaspoon of mincemeat (not too splody, please). Reroll the remaining dough and cut out your top shapes. You can brush with egg wash and sprinkle on some cinnamon sugar now if you want. Cook for 10-15 minutes depending on your oven, and do keep an eye on them! Ah, so many little adventures I need to tell you all about! Crafting, snooping and wining and dining aplenty going on around here at the moment. Also... jaunts. Most of them are local, but happily I am in the process of booking tickets to take me to nearish and faraway but all completely wonderful places. Home to Ireland for Christmas, naturally. A possible transatlantic trip in the New Year. But most excitingly for now: another trip to my favourite city in Europe - Paris! Yes, I went in August. I'd already planned to return, and now Le Nouveau Paris are running a competition asking what you'd do on a weekend over there. Me, I'd do all the things that I didn't have time to get to, or which were closed for the holidays in August. It only seems fair to return and drink chocolat chaud in Les Deux Magots and then spend time wandering around the St-Germain des Pres and Montparnasse. I missed the Catacombs and so I'll bundle up warm for a trip down there. and at Entree Des Fournisseurs, which guttingly was closed last time and I could only peer in the window like a kid denied candy. I would also spend more time looking for Space Invaders, in honour of Pauline. We've wanted to eat here for ages - Refuge Des Fondus which is apparently great fun. And Pierre Hermé was closed in August - donne moi les macarons! I really love finding good food in my neighbourhood. So I was quietly giddy when I heard about a new local supper club - essentially it's when someone opens their home to guests (in return for a 'donation' as of course not being a real restaurant they can't have paying customers) and lets loose their culinary imagination - and as much talent as they can muster - on their menu. We really, really hit it lucky. Simon and Yuen of Fernandez and Leluu are avid foodies and wonderful hosts - frankly, they seem almost surprised by the overwhelmingly positive reaction they seem to be receiving, but they shouldn't be. From their blog you can see how much time, patience and passion they invest in this project - in addition to fulltime jobs. I coveted their vintage typewriters. I adored the napkins and crockery. Yeah, by the end my photography skills had gone by the wayside. Too busy concentrating on food. Marvelling at how we could possibly fit in the ice cream and ginger to-die-for shortbread. Wanting to move in. That sort of thing.